The federal government turned up in southern Wisconsin last week to refresh local gun dealers on security tactics following an uptick in store thefts across the region. The Bureau of Alcohol, Tobacco, Firearms and Explosives partnered with the Rock County Sheriff’s Office for an educational seminar Feb. 15 in Janesville, about 75 miles southwest of Milwaukee. The agency said local law enforcement reached out for guidance after a string of FFL thefts. 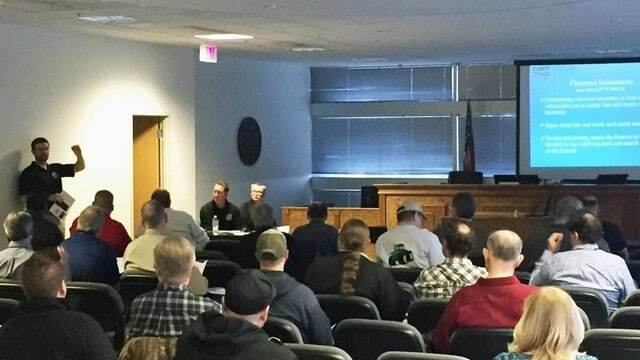 More than three dozen federally licensed dealers and officers from Janesville and Beloit police departments attended the free seminar, where ATF agents reviewed security measures and proper inventory protocol. ATF Director of Industry Operations Hans Hummel said the federal partnership with local dealers is “critical” and often provides insights many are missing when it comes to keeping inventory safe. Southwestern Wisconsin isn’t the only area grappling with an unprecedented spike in FFL thefts. Guns stolen from federally licensed dealers exceeded 8,000 last year, according to a federal report released last month. The ATF recorded 7,841 firearms stolen during 577 burglaries in 2017. An additional 288 guns were taken during 33 FFL robberies. In all, the number of guns stolen last year increased about 3 percent over 2016. Firearms taken over the last five years have more than doubled, according to the ATF.